Sleeping with a baby between you doesn’t make for the best night’s sleep. We slept in to about 6:30 local time, and headed off to breakfast. I think breakfast is the best meal of the day around here—they have a slew of foods that Aiden can eat, and that helps occupy him while we attempt to have some form of normalcy. The “nice” restaurants on the complex all require reservations. And reservations happen at 8:45 local time. By the time we were finished with breakfast, we decided to give the reservations a try, but quickly gave up since we had another 45 minutes to wait. It was a real nice day, so we went to the pool to swim. The pool water was a bit colder than we would have liked, and it took Aiden a while to get used to it. Still, once he got over the initial shock, he had a lot of fun. He has a little floaty boat that he can sit in, and mommy and daddy pushed him around the whole pool in it. The sun was getting hot, so Aiden and daddy headed back to the room for a nap while Tanya tanned by the pool. After a shower to clean the pool water off, Aiden zonked out almost immediately, laying on daddy’s stomach. Daddy was pinned underneath him for the hour and a half he slept, while mommy went exploring with the camera. After everyone was awake, we went to the stores near our hotel. Aiden found some plants to play with while Mommy bought a dress. The sun was pretty hot, and Aiden actually wore his baseball hat to keep the sun out of his face. We stopped by yet another Riu hotel, the Riu Tequila, and Aiden ate some Gerber’s there. We ended up going to bed rather early, since everyone was tired. Aiden woke up around 7:30, which is late for him. The mornings are a bit of an ordeal, since only one person can really get ready at a time—the other is busy watching after Aiden. The hotel room has a two-step drop down to the area where the couch and TV live, and we tried to block it off with a barricade of suitcases. Still, there is plenty of trouble he can find if he looks. Breakfast was…sufficient. The “all-inclusive” resorts always have plenty of food, but all of it tends to be just average. Aiden snacked on our food as well—not surprisingly, he liked the sugary foods. Donuts, fruit loops, and cocoa puffs went over better than the fruits, pancakes, and eggs. He didn’t drink much of the milk they supplied. After breakfast, we toured the resort. There is a magnificent series of pools and fountains right in the middle, stretching nearly the length of the whole complex. Aiden was fascinated by the fountains, and would have jumped into the shallow pool if not for us to stop him. Still, he loves to run around on his own, like a big boy. For the most part, he’ll follow you, and won’t get more than 50 feet away. If you run ahead of him, turn around, and beckon to him, he thinks that’s hilarious and will run to you. But if he sets his mind to it, and you’re not paying attention, he’ll just start walking off. Further down is the actual swimming pools and more restaurants. Past that is the beach, but on the way you pass through a fantastic jungle of palm trees, sand, and small islands of grass and shrubberies. The beach itself is nice, and there are enormous rocks to break the waves right off shore. We tried to get Aiden to get in the water, but every time the wave rushed up around his feet, he got scared. To the side, there was a path leading to what we later discovered is the neighboring resort, the Riu Yucatan. Our wristbands give us full access to the whole suite of Riu hotels, so we figured we’d explore this one since we were there. There were monkeys. At least, that’s what the signs lead us to believe. All we could find were these crazy rat-monster animals everywhere. Turns out, they’re called Agouti. We walked around, looking for either monkeys, or a way back to our hotel, and could find neither. There is a chain-link fence separating the two for the entire length of the resort, with the only exception down at the beach where we entered in the first place. Only when we turned around to head back to the beach did we find the monkeys. They were having a good ole’ time on top of the main eatery. Wild monkeys of Mexico, right here in our back yard. Don’t feed them, we were warned. We headed back to the room, with everyone tired. It was nearly 11:00 (Still haven’t switched to DST…I’m protesting), which is Aiden’s sleepy time. Plus, he already had more excitement and exercise than he usually gets in a whole day. He zonked out pretty quickly, and Tanya took the opportunity to lay out in whatever sun happened to poke through the clouds. Around noon, a phone call to the room (wrong number!) woke up Aiden. I need to unplug that phone. The two of us headed out in search of Tanya, who we found back at the beach soaking up the rays. Taking someone’s recommendation, we decided to walk down to the new Riu hotel, the Riu Palace, for lunch. We passed yet another Riu on the way, and remarked how we were glad that ours seemed the nicest of the three we had yet seen. Still, we cashed in on our all-inclusiveness and got a drink for the road. The Riu Palace was a good half-mile down the road, but Aiden was enjoying (or, at least, putting up with) the stroller, so it went by quickly. There were several shops across the road that we’ll have to look into later. The Palace itself has quite a façade around it, but doesn’t seem all that impressive on the inside. Indeed, our fountains and pools seem better. Still, the food there was better than the food in our hotel—even though it was just a buffet. We played around outside for a while, and inside for a while longer. The walk back was more tiring, and Aiden fell asleep in the stroller on the way back. The sidewalk is unbelievably bumpy—a surprising amount of it is brick, even. He even stayed asleep once we transferred him to the bed in the room. Later, we explored more of our hotel, with Aiden playing with the plants near the fountains. We found a swing, but he didn’t like it as much as he has in the past. The flowers were falling at one spot, and Aiden thought the mass of them on the ground was quite interesting. It’s nice when simple things like that can occupy him for several minutes at a time and let you recuperate. We hit the beach one last time, and I got eaten alive by chiquistas–Mexican mosquitos. It was getting dark and late, so we headed back to the room. It took a while for Aiden to fall asleep, even after Gerber’s and formula, but he finally dozed off. The traveling process left a lot to be desired. Friday, a blizzard started in Louisville. Normally, that wouldn’t be a problem, and would in fact be borderline preferable. Snow is fun. Snow delays work. But today, snow would get in the way of the trip. By Saturday morning, we had a good 8 inches of snow on the ground. We left home around 8:00 AM, and while the drive to the airport is usually about 20 minutes, it took well over an hour. I don’t think we broke 35 mph the whole time. I didn’t see a square inch of actual asphalt peeking through the thick snow on the interstates. Still, we made it. The check-in process was confounded by having a non-ticket-holding infant with us, but we eventually made it past ticketing, past security (NO LIQUIDS…unless you have a baby, in which case it’s ok. Terrorists don’t have children, right? ), and to the gate. Flights all around us were being cancelled. We sat next to a lady whose 6:50 AM flight toward Cancun (through Chicago) had been cancelled, and watched with pity as her “new” 10:30 flight was cancelled as well. In fact, we were the only flight in our group of four gates to actually fly out over the three hours we waited. Next, we waited for an hour on the plane, as the only working deicing truck took care of more important planes. Aiden got a bit cranky sitting in this aluminium deathtrap. Finally, we took off. Aiden did pretty well, considering it was his first flight. He ate some cookies, read some books, played with some toys, and even watched a cartoon on the laptop. On the descent, however, he got pretty cranky. His ears were probably popping, and he wouldn’t drink anything to help them. We arrived in Dallas/Fort Worth with 50 minutes until our next flight. We hurried over to the next departing gate, hoping to find some lunch. We went too far, and had to backtrack, eating up some of our layover time. We ended up grabbing a bite at McD’s and cramming it in as the flight was boarding. Spring break must be in session, as the vast majority of the passengers were very obviously on a mission to party. In fact, several of them had already begun the partying process, as was evident by the smell of alcohol and flagrant disregard for whatever the flight attendant was asking them to do. Aiden was an angel on this flight. He was asleep before we took off, and only woke up on the descent. A few cookies, some water, and playing peek-a-boo with the people behind us helped keep him occupied until we landed. Immigration and customs was just about as fun as it sounds. It took about 45 minutes in line for immigrations, and another 25 for customs…not that we have an option. Playa del Carmen is surprisingly far away from Cancun. We opted for the 45-minute cab ride instead of the 2-hour shuttle, even at extra cost. It was already past sunset, and the “sunny, tropical paradise” we know and love was more of a “dark, hot, muggy place that still isn’t the hotel”. We went to the zoo today! Everybody had a great time, and the weather really cooperated. 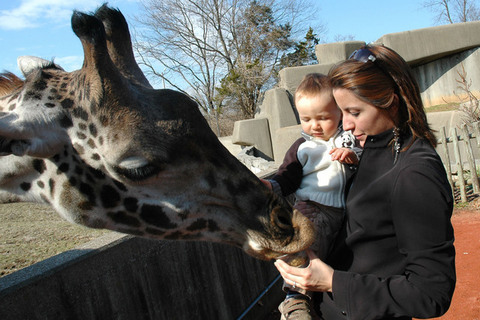 Aiden saw all kinds of animals, and especially liked the monkeys, birds, and the giraffe…..until the giraffe got a bit too close. More photos over at dhtns.com. Aiden had his first haircut today. He was starting to grow a bit of a mullet in the back, so we had to trim that up. He was a pretty good sport, but probably only because he didn’t realize what was going on–Daddy was distracting him while mommy operated the shears. Just a bit off the back, and a tad off around the ears. Now he’s more handsome than ever! Aiden’s all better now, after a bout with his sickness. His temperature is back to normal, he’s much less cranky, and everybody is very relieved.